Our friend Ron Lewen has recently devoted himself to a world-wide campaign dedicated to “Saving the Naked Fatty”. 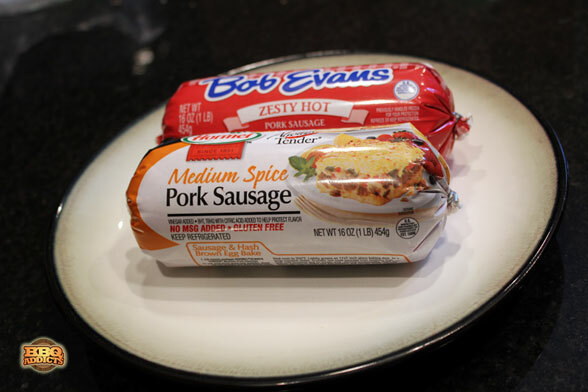 As much as we enjoy the extravagant bacon wrapped and cheese stuffed fatties that are floating around the interwebs these days, we wanted to pay tribute to Ron’s efforts and dish up our version of the fore-father to the Bacon Explosion. 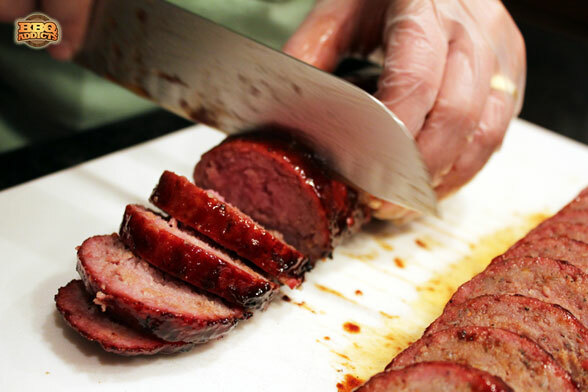 Those of you that are fans of our BBQ Addicts Facebook page got a sneak peek of this recipe over the weekend, but now we’re rolling out the entire process with even more pictures! We started out by picking up a couple of 1 pound sausage chubs at the grocery store. We like our food on the hotter side, so I went with a medium and a hot. Carefully remove the plastic sleeve while trying not to disturb the natural “chub” shape. Once removed, sprinkle gingerly with your favorite barbecue rub. 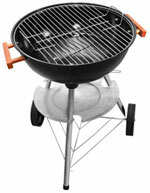 I chose to use our Smokey Kansas City All-Purpose Seasoning, which is also our competition rub. 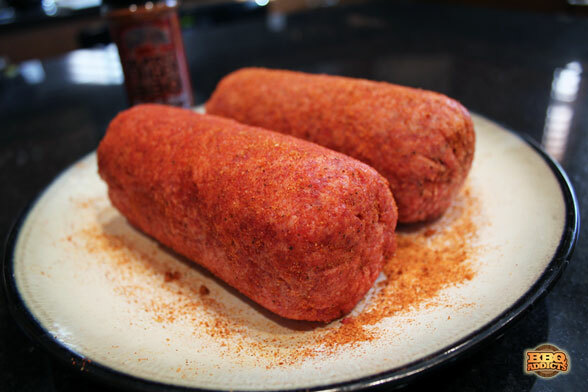 Just keep in mind that sausage is already seasoned pork, so the sodium levels can get out of control really quickly if you go heavy on the rub. 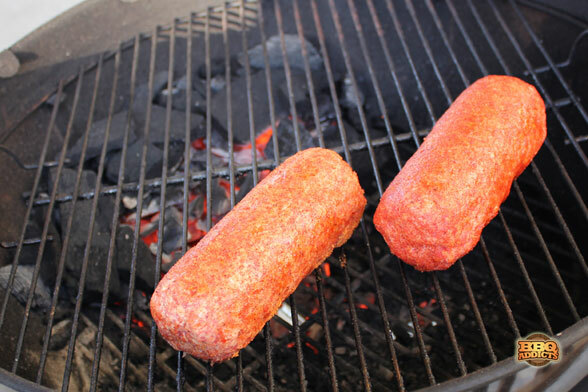 Place the sausage on a grill or smoker over indirect heat at 250 degrees until the internal temperature reaches 160 degrees, which will take about an hour. 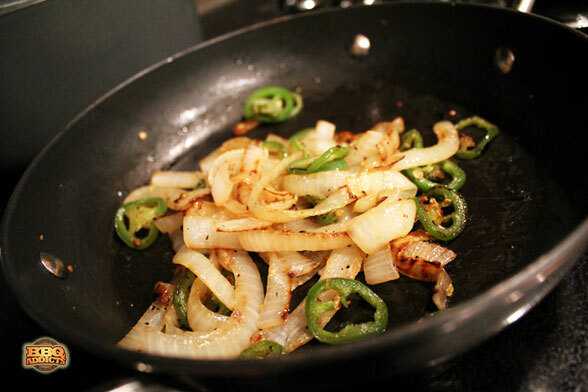 While the sausage was smoking away on the grill, I sauteed some sweet yellow onions and fresh jalapenos in a touch of grape seed oil. After about 30 minutes I took a quick peek to add some more wood chips, and this is what I found inside the grill. 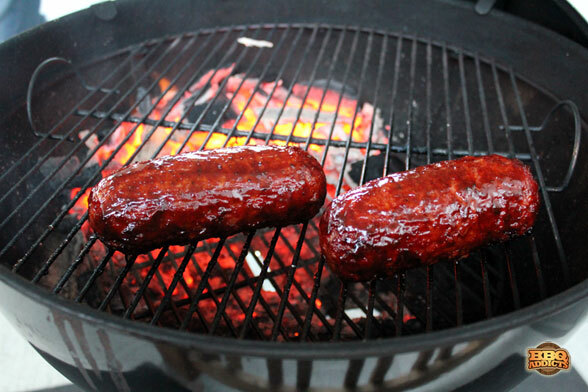 Once the sausage reaches an internal temperature of 150 degrees, give it a quick glazing of barbecue sauce. I used our Smokey Kansas City Original BBQ Sauce, but any BBQ sauce you like will work. Just make sure it has some sugar in it, that way the sauce will caramelize as the sausage finishes cooking. Once the sausage reaches 160 degrees, remove it from the grill and let it rest for a few minutes so the juices can settle back into the meat. Since these are relatively small pieces of meat, I just let them rest until I’m able to handle them without burning my fingers. Bigger cuts of meat like briskets and butts would need to rest quite a bit longer because they retain quite a bit more heat. Once cooled, slice the fatties into 1/4 to 1/2 inch discs. 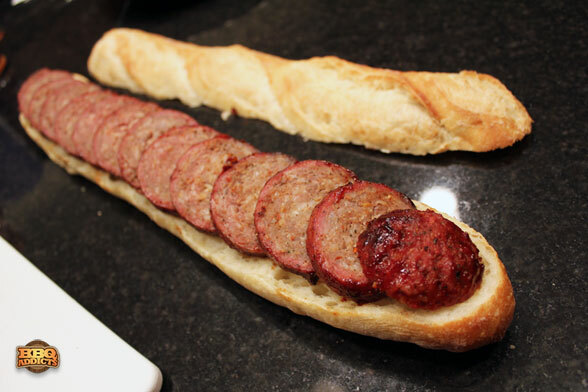 We liked the flavor of the hot sausage better, so I placed all of the discs from that fatty on a warm freshly baked baguette. 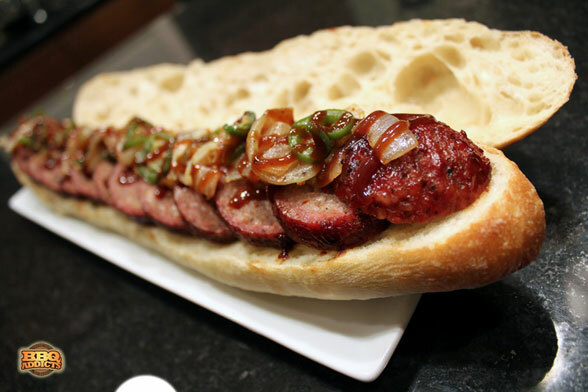 …and drizzled barbecue sauce over the entire sandwich. 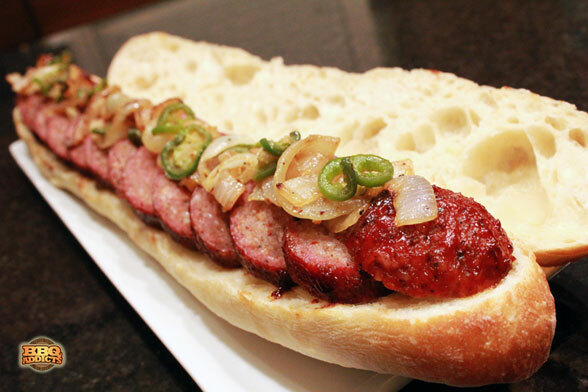 As simple as this dish is, it’s extremely tasty and an extremely easy sausage recipe and a way to get your barbecue fix in the middle of the week when you don’t have time for those long smoke sessions. No offense to your bacon weave, but I like my fatties naked too, ha ha. That’s probably because I do my cooks overnight and usually the fatty is something to go with pancakes or eggs. But I’ve never tried a fatty sandwich like that, I have to give that a shot. of the filty minded people that write you comments has to try to mess up a good thing for family folks that is trying to live a clean life. I just ate dinner and with a full tummy you have managed to make me salivate! Cant say the first pics looked appetising, but my mouth was watering once it was sliced and put in a sandwich. This is def a recipe I will bookmark. Being from the UK I am pretty particular on my bangers (sausages to you guys!) but I have to admit, reading through this my mouth is watering! I would love to tour the US throughout some of your amazing BBQ restaurants that the UK definitely lack! I try to keep some of the tastes of the US BBQ scene through http://www.bbqsauces.co.uk so I do try! That looks awesome. I can’t wait to try it! Intense! 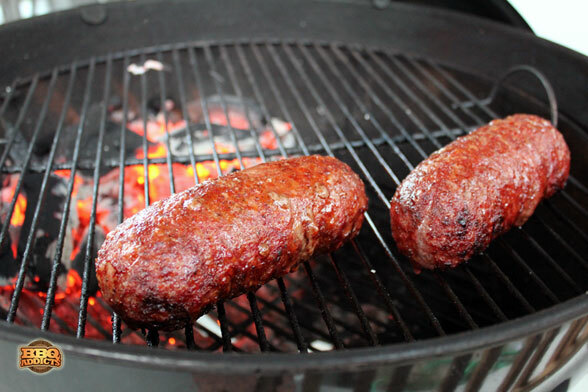 I’m gearing up to try with venison sausage!